Altering Display Preferences in Find. When you first use Find, there are default display settings in place. You can change these to suit your needs at any time. To access display preferences, click the Settings tab in the main menu, and then click the Display Preferences sub-tab on the left. When you have finished making your desired changes, click Update. The sidebar appears on the right of the page. The default sidebar that displays is your list of saved searches. You may prefer to see your reports or your hot feeds when you first open Find. Using the My Landing Page drop-down menu, select if you would like My Searches, Hot Feeds, My Reports, or My Map to display by default. When you log in, your default search criteria are processed, and the current results display. By default there is no search criteria and it will display all properties. You can select one of your saved searches from the My Default Search drop-down list to be the default search. It will update and display the next time you log in. Note: Before you can change the default search, you must first create and save a new Search. Select what you want to see in the Suggestion Box that appears when you place your cursor in the search text box. The default is set to show you all suggestion options. You can change what is displayed by checking or clearing the check boxes beside the options you want to hide. When you access Find, any new announcements, error messages, or system messages display by default. Clear the check boxes beside the messages you do not want to see. The Results Breakdown column on the left of the search page can be customized to show your choice of categories. Your customizations are saved so that each time you access Find, the same categories appear. If you wish to reset the categories to the default selection (Bedrooms, Price, Bathrooms, City, Zip), click the Reset to Default Categories button. Adjust the number of properties displaying on the Search Results page by editing the number at the bottom of the Search Results page. 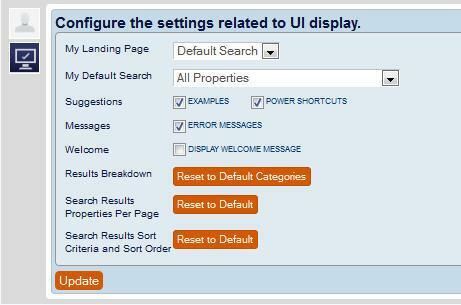 To reset to the default results count of 20 properties per page, click the Reset to Default button. Choose the sort order of the properties displaying on the Search Results page by clicking on the current sort option in the Sort By box at the top of the Search Results page. To reset to the default results sort order of Freshness, click the Reset to Default button. Next Lesson: Searching with Power Shortcuts in Find.